Earlier this year, the Daily Mirror reported that in the United Kingdom, accidents in the manufacturing industry alone comprise 20% of all fatal workplace accidents. All over the world, forklifts pose a danger to their operators as well as the people and equipment or inventory in close proximity. You do not have to look far to see examples of forklift accidents and what can seem like a minor mistake may end up with huge consequnces, either to other employees and pedestrians or warehouse equipment and stock. Outside of the city of Seattle, a 69-year-old American man was killed in August when he walked in front of a forklift outside a shop’s car park. The driver was carrying merchandise on the forklift at the time and slammed on the brakes when he saw the man, which resulted in the box of merchandise falling forward onto the victim. In Victoria, a nine-month-old baby tragically died in December as a result of head injuries sustained when he crawled onto the floor of an automotive workshop and was struck by a forklift. In June, a man was killed in a forklift accident in Port Macquarie, NSW, when an engine that weighed more than a ton fell off a forklift, crushing the victim. These tragic accidents happen every year as a result of companies not properly training and educating their team members. Apart from the injury caused to people, lots of damage can also be done to equipment and inventory that is around when forklift accidents occur. People at your warehouse or factory who are responsible for keeping an eye on those who are operating devices like forklifts must be in position to track the actions of their employees whenever they need to. Whether they do a routine inspection of the area when forklifts are being driven or there are videos in place of drivers using them, it’s important that the right people are taking time to review the way that team members are operating forklifts. The beginning of the year is a better time than ever to review your policies about using forklifts and see where there’s room for improvement. If you notice areas where you might be able to improve your policies so that you can do a better job at preventing forklift accidents, come up with a replacement or edit to existing policies that makes sense. 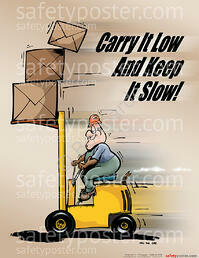 How fast are your forklift drivers allowed to go? 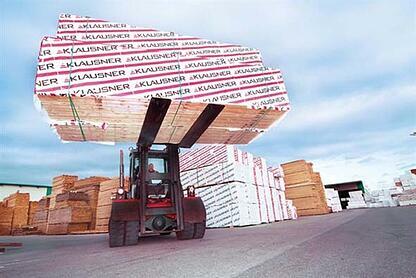 In which areas are they allowed to drive forklifts? These and other standard guidelines for forklift operation should be changed as necessary so that you can ensure everyone is safe while operating your forklifts. arehouse and facility managers at the beginning of the year is checking equipment to determine whether or not it is in good condition. If it isn’t, steps need to be taken immediately to correct the situation. 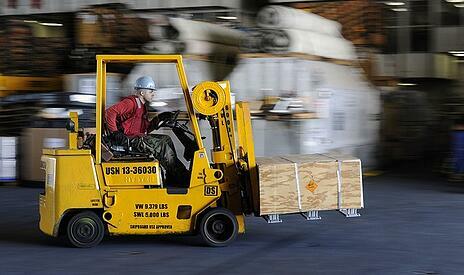 Faulty equipment can be a serious issue that can cause a forklift accident to happen unnecessarily. There are several common elements of forklift maintenance, including making sure that it’s fuelled properly, lubricating the parts, and ensuring that the gauges work the way they’re supposed to. For specific instructions on how to maintain your forklifts for maximum equipment efficiency, refer to the specific directions or documentation that came from the forklift’s manufacturer. 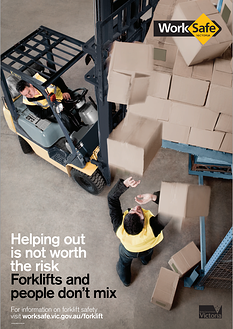 A big part of preventing forklift accidents is the creation of areas that are easier for forklifts to drive through. If your warehouse or facility does not currently have systems in place that allow you to get forklifts where they need to go in a quick and safe manner, you may want to invest in some products that will help you. All types of access doors and barriers and high speed doors can be valuable for helping ensure that forklift traffic flows smoothly. For example, Remax’s Movidor High Speed doors with Integrated Traffic Lights are a great option if your facility needs to regulate the way that forklifts go between different sections of the warehouse or production floor. Compact Sectional Doors are another great option if you want to make sure that you are using durable doors that save energy and require minimal maintenance. 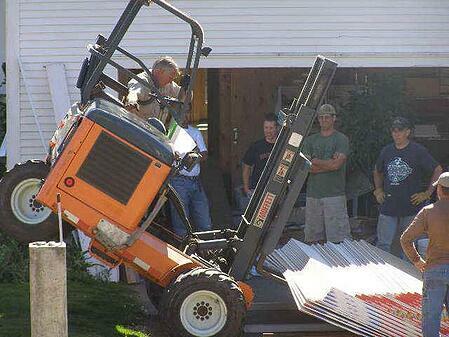 Forklifts are serious pieces of machinery that must be handled in an equally serious way. If you’re interested in learning more about keeping your warehouse safe, check out the Remax guide to Optimising Forklift Safety & Efficiency and The Buyer’s Guide to Warehouse Roller Door Selection so you can learn some of the best practices for reducing the frequency of forklift accidents to create a safer working environment in 2015.